The International Women’s Club of Moscow was founded in 1978 and existed in a world different from the one we see today. Moscow was a world capital of accredited diplomats, a few journalists and foreign businessmen. Those serving in posts in the capital of the Soviet Union were given specific places to live and strict rules to follow. Foreigners all lived in assigned blocks, such as Korovy Val, Leninsky Pr. 45 and 148, Kutuzovsky Pr. 7, 13 and 14. Only one car per family was allowed, and it was difficult to travel beyond the city limits, marked by the Moscow Circular Motor Road, now the Moscow Outer Ring (MKAD). Recollections of members of the IWC during those founding years bring to light some interesting nuances. Living conditions in the Soviet Union were very difficult at this time. Everything was short: food, medicines, clothes “and the sharing of information on where to buy something or to get a good doctor for an ill child was very intensive,” said Marie-José Marous (France) IWC Assistant Treasurer since 1999, who joined the IWC of Moscow in 1985. “Communicating with family and friends abroad was very difficult. Direct international phone calls from the flats were impossible.. As an alternative foreigners should have had contacts with the Russian population, but even though it was not officially prohibited, it was not recommended.” There was no international press, and only two or three Russian TV channels broadcasting ‘very unilateral news’ existed. Remembering her first apartment in Moscow, Giancarla said, “The small size of our apartment did not prevent us from organizing wonderful dinners with our friends and guests. We lived more like in a big community, counting very much on each other’s help and the get-togethers were very frequent, as there were only a few restaurants in Moscow and it was not easy to get a table.” This background information is “important if you want to understand the spirit of the club member who was depending on those living conditions,” Marie José said. “It was like a big family… I remember when we were told about the opening of the first western food shops, we were so happy then!”. Jennifer Louis tells us that in 1978, four women from the United States married to foreign diplomats, who were not eligible to join the American Wives’ Association decided that it was time for an international club to be set up in Moscow, similar to the clubs they had belonged to in other parts of the world. Trudi McLaine, wife of the Canadian Minister-Counsellor; Therese Brennen, wife of the Irish Ambassador; Vangie Clare, wife of the Ambassador of the newly-opened Jamaican Embassy; and Delmar Fall, wife of a Counsellor and Head of Chancery at the British Embassy (later to return as Ambassador) had ideas and plans that would bring the women of all foreign nations represented in the Soviet Union’s capital together for friendship, activities and cultural exchange. The first small steps were interesting milestones. Devika Teja, wife of the Indian Minister, invited the group to her residence for the first meeting of the IWC in Moscow. Jennifer, the author of several travel guidebooks on Russia, was asked to speak about traveling in the Soviet Union. Nina Stevens organized practical demonstrations of Russian cooking in her home, and many other interest groups soon followed. The first charter was written by a capable lawyer, wife of the Liberian Ambassador. An early member recalled that a serious document was needed because the Soviet Foreign Ministry was “quite upset to find all sorts of different categories of wives joining forces, particularly when they wanted to obtain permission to travel together.” Leaders of the new club stressed that they were an international organization, such as already existed in other parts of the world, and were not “dangerous”. According to Jennifer, they thought of asking Valentina Tereshkova (the Soviet Union’s first woman in space) to become an honorary member and help smooth their path. Early on it was decided to make a feature of March 8th – International Women’s Day. When Mikhail Gorbachev was elected Secretary General of the Communist Party in 1985, Alla was one the few Soviet women in Moscow who knew about the existence of the IWC and thought that it was possibly time to establish contacts with the Club. From Halina’s letter we know that there were more than 300 members in 1986, and 23 interest groups in which members were learning languages, literature and art, national dances and music, handicrafts, flower arrangement, practicing sports, etc. “Almost all the Soviet ladies, including Nanuly Shevardnadze, the wife of the Minister of Foreign Affairs of the USSR Eduard Shevardnadze (now President of Georgia), accepted the invitation to attend the event. And I can say that was an ‘official recognition’ of the Club,” Alla said. From that time on, UpDK started “rendering services” to the Club, including assistance in purchasing Club equipment, organizing excursions in Moscow and its suburbs, and further afield to such places as Kiev, Riga, Tallinn, Samarkand, Zagorsk (now Sergiev Possad), Abramtsevo, Suzdal and Vladimir, Volokolamsk, Pereyaslavl, Rostov. Marie-José Marous has wonderful memories of a trip made to Georgia in 1987, in which about 100 ladies participated. They were greeted and accompanied by the Minister of Foreign Affairs of Georgia and were treated as VIP guests the whole time. UpDK opened its Sports and Cultural Center in 1989, and many opportunities were offered to Club members, such as ballet classes, folk dancing, painting, chess, horse riding, and gymnastics for mother and child. On March 30th, 1989, UpDK organized its first event for the IWC, a performance of a famous Russian folk group, “Russian Song” There was also an exhibition and sale of flowers and plants specially brought from Estonia, a book and souvenir sale, and tasting and sale of pastries. In April 1989, the IWC held it’s first general meeting in the UpDK Cultural Center, which included chamber music and an art exhibition from the collection of Club member Tania Kolodzie-Holngren. In June 1989, Valeria Pavlovskaya managed to find space for an IWC office at the Cultural Center, for which we continue to be grateful. Indeed, we have much to be grateful to UpDK for. In the difficult period from 1989-91 shops were empty, and the Moscow government decided to introduce a special distribution system for basic essential products. Alla was asked to tell IWC members at a general meeting that foreigners living in Moscow could get “talons” (coupons) for each member of their family from their residence house-manager’s office. At that time, UpDK organized very well-attended sales at the Cultural Center of products such as poultry, mushrooms, pastries, vegetables, etc. By 1988, the Club had more than 400 members, and by September 1989 this number had grown to 562. Socially, the IWC was a resounding success from the beginning. Well-attended meetings took place one Thursday every month. “Our general meetings were all very successful and attended by a large number of members (remember how limited were our possibilities of spending time and money anywhere else! ),” said Giancarla. “Mrs. Shevardnadze attended quite a few of them and one I can remember was held at the German Embassy Residence, where the first Soviet designer, Slava Zaitsev, held his fashion show. “Interest groups continued to expand. Many were the same as those offered today, but inevitably this is something that has changed year by year. In 1987, the IWC December general meeting took place at the Swedish Embassy with the traditional Swedish Lucia performance and carols and an exchange of presents between members. Soviet handicrafts, handmade ornaments and holiday decorations were for sale, as well as Unicef cards. The 1988 December meeting could be considered the first IWC “Winter Bazaar”. 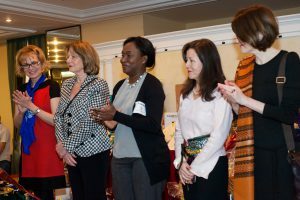 It was held at the U.S. Ambassador’s residence, Spaso House, and donations came from members as well as from the first sponsors. The funds raised were donated to Armenia, which had suffered a disastrous earthquake. “The Club began its real charity work when the earthquake in Armenia happened,” said Marie-José. “Foreign countries sent help, and everybody in Moscow felt concerned: embassies, foreign schools, companies and organizations present in Moscow participated in raising funds, collecting clothes, blankets, food, medicines and medical equipment.” The Swedish Embassy hosted the 1989 Winter Bazaar, which for the first time included a raffle. The money raised that year went to a Children’s Fund. The constitution of the International Women’s Club of Moscow was revised by Denise Sebastian (USA) in April 2000 to take into account various documents that had been produced over the years. Article 2 states that “the purpose of the Club is to promote friendship and to further cultural activities among women of all nationalities residing in Moscow and to raise funds to be donated to charitable activities.” This really sums up the essence of our Club as it has been since its inception. In 1990 and 1991 IWC Steering Committee members attended a rally-meeting held at the Bolshoi Theatre as part of the official International Women’s Day celebrations and were invited by Raissa Gorbacheva to the reception organized for the occasion, an honor for our Club. “Although most foreigners were spared the devastating effects of Russia’s runaway inflation and currency fluctuations, we did face periods of great uncertainty.” The economic crisis of August 1998 was another difficult phase, she said, with exploding unemployment, closed banks, depleted food supplies, hoarding, soaring prices and many foreigners leaving. This is all reflected in the membership of the IWC, which in 1998 dropped from 1240 in June to 651 in October. Numbers have gradually increased again in recent years and were at 859in April 2001. As allowed in our constitution, five percent of our members are Russian, with a growing waiting list for this category. The current membership is split almost equally between women from the diplomatic and business communities. Newcomers are welcomed to the Club at monthly Coffee Mornings hosted by an Ambassador’s wife, where the Newcomers Committee provides them with a “welcome” package containing information on the Club and on Moscow. General Meetings are held on the third Thursday of each month at an Ambassador’s residence, which gives the host country an opportunity to project its culture. Our Newsletter remains a great source of information for members and often runs to 20 or more pages according to Birthe Rasmussen (Denmark). Members are encouraged to contribute their stories and we accept non-commercial advertisements from members. Says Juliana Hasseling, we are able to advertise Club events in foreign language newspapers, such as the Moscow Times and Moscow Tribune, and on the Internet. 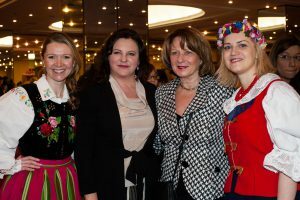 Sometimes our events are attended by and reported on by the press, and this year, for the first time, Russian newspapers covered the Winter Bazaar and the Embassies Ball. This was also covered in Diplomat magazine, which had earlier published interviews with presidents Birgit Canisius in June 2000 and Nilima Lambah in January 2001. The main focus of the IWC today is the Interest groups, the Charities group and Fundraising. Interest groups remain as popular as ever, but what is offered fluctuates according to who is willing to volunteer their time or talent. At present we have 80 different groups covering a broad range of activities – Architecture, Art, Charities, Children, Cooking, Creative Art, Dance, Games, History and Culture, Languages, Literature, Museums, Music, Spiritual Welfare, Sports and Theater. Whilst at the moment we have lost such groups as Galloping Gourmet, Computing and Wine Tasting, we have gained Turkish Cooking, Reiki, Alpine and Cross Country Skiing, and Russian Tradition, which is run by Alla Semenova, who is keeping her promise to remain active with the IWC after her retirement. Some groups meet in people’s homes, others at museums and one literature group even meet in a room at a bookshop! Some groups require members to contribute by researching and presenting a topic. In others, you just sit back, watch or listen and enjoy! You could be out all day every day doing something with the IWC, and an indication of the enthusiasm of members is that some groups have to operate a waiting list. Our scope is determined by the availability of enthusiastic Club members who offer to share their talents and knowledge to groups, or help co-ordinate them. The Interest Groups give continuity to the activities of the IWC through the year.